Previous owner installed Gotham Cycles HID kit for low beam. I replaced the parking lights in both the low beam and the high beam housings with LEDs (link below) and a Sylvania SilverStar for the high beam. Everything worked great for a few days until yesterday when leaving work I noticed the parking light in the high beam housing, and the low beam HID were not on while in operation. The high beam and and low beam parking light work without issue. I checked my fuse box and everything seems to be alright. I have another HID coming from Xenon Depot anyway and plenty of spare LEDs in the odd chance both just happened to blow, but any other experiences would be valuable information. Have a service appointment on the 25th, so I'll be sure to mention then too. Don't want to state the obvious, but you did check the low beam with the engine running?? Apologies if you did. As for the park light I have no idea. I have been running LED park lights with my HID lo and hi beams for a year and a half with no issues. Heh, yes. No apologies nessecary. It's a valid point. The first few days I didn't catch on that the headlights don't operate unless the engine is running. So last night I had a little time to check everything with a buddy and we found some interesting results. The main headlight issue seems to be the result of a loose fuse. Re-seating it fixed the problem. Hooray for that. Obviously this was the reason the High Beam parking light was not working. Replacing the LED proved it as the replacement lit immediately. But what caused the burning? Curious! It's obvious that the high beam seemed to have something to do with it. 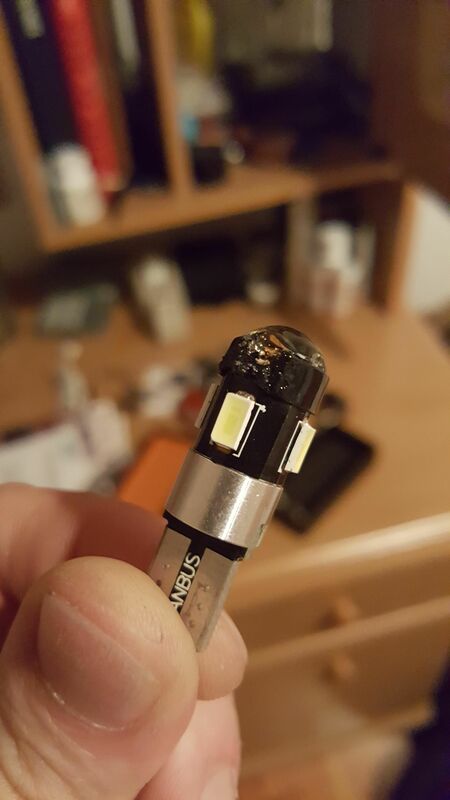 A few days before I had installed a Sylvania SilverStar high beam and suspected it might have been the cause (despite being rated for the same voltage and wattage as the previous Sylvania 12v/55 watt bulb). Sure enough, we pulled the parking light from the housing and gave the bright a flash. After just a couple of seconds, smoke was clearly coming from inside the housing. Next step was to remove the Sylvania lamp from the housing. Turning on the bright generated a lot of heat (as to be expected from a halogen) but no visible smoke. Hmph. Now, it's worth noting that these are replacement LEDs bought off Amazon (Link is in the first post of the thread). Is it possible they're simply not capable of withstanding as much heat as the previous LEDs? Something in the housing seems to be the cause of the smoke but I'm unsure if the parking light just happens to be an innocent victim amidst all this. The Parking light in the low beam housing seems to be holding up alright, but that housing seems to have a touch more volume and is running an HID bulb, which from my understanding has a lower operating temperature. 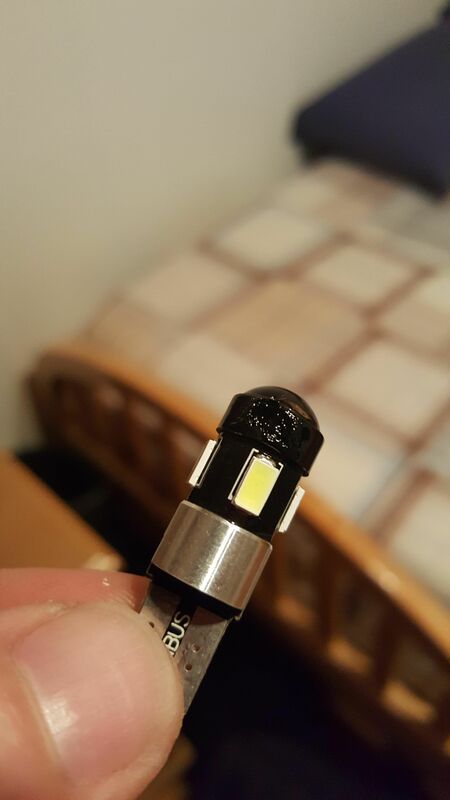 If I replaced the High Beam with an LED bulb such as the one in the link below, might spare myself a few more crispy parking lights? If so, would it be prudent to also swap out the HID to maintain overall cooler operating temperatures? I run the Opt7 LED high and low beam. During the day I ride with my high beam on at all times. I haven't noticed anything melting but I'll check. Thanks, Wak. Can I ask how your experience with them has been? Installation, draw, heat, brightness, issues? Anything I should know going forward? They are a giant improvement over stock. 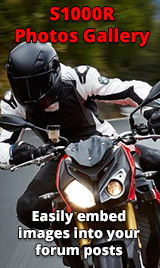 I have the low beam wired to the canbus under the left fairing so it remains on when the high beam is on, so they are both running most of the time I ride and I haven't noticed any issues. Got caught in a HUGE downpour on saturday that I was not expecting and had no issues with the lack of the rubber dust boot on the low beam side. You have a thread anywhere, where you detail how you did this? It's some crazy US legislation I understand and is localized to US bikes. In the EU the low beam stays on as a default option. If you do a search for "Hi beam Shut off cure" there is a large thread with a load of tinkering in it.